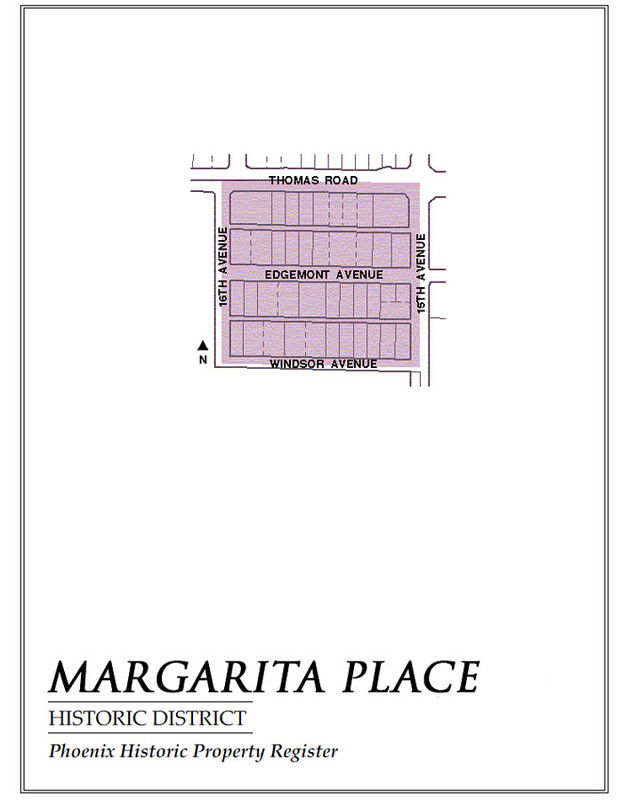 Margarita Place was a residential suburb of the city of Phoenix when it was platted as a subdivision back in 1927, and it still is in many ways. The Encanto 18 Golf Course wraps the small neighborhood on the west and south, while Encanto Park borders Margarita Place on the east. Less than two miles from downtown Phoenix, the Margarita Place Historic District retains its original residential calm thanks to surrounding green space. But unlike modern Valley subdivisions in Phoenix, the homes in Margarita Place span a stylistic spectrum. Ranch style homes from the 40s sit comfortably next to 30s Period Revival styles—Tudor/Elizabethan, Spanish Colonial, Mission Revival or Southwest Revival. Each house in Margarita Place was built with its own unique personality. Low-pitched roofs of Ranches mingle with steeply pitched Tudors and the horizontal lines of Spanish Colonials. One house wears scuppers; the next, arched portals or a a wood-post porch. Margarita Place may be the best historic district to visit if you want to learn the various architectural styles and details of historic Phoenix. Welcome to historicphoenix.com, your #1 internet resource for buying and selling historic Margarita Place real estate. On this site, you will be able to find nearby school information, restaurants and grocery stores, buyer resources, seller resources, and search all Margarita Place homes for sale. Our goal is to provide you with the most valuable information and service regarding historic Margarita Place real estate and homes for sale. Through this site, we provide you with access to MLS listings and resources for buying and selling a home, but most of all, an easy way to access expert guidance as your time to buy or sell Margarita Place real estate approaches. In today's real estate market, it takes more effort, time, and resources to sell your Margarita Place home. We are personally committed and passionate not only about selling your home, but selling it for maximum market value. We offer our clients a full line of services and a network of service providers to not only provide you with maximum market exposure through our extensive and aggressive marketing plan, but to provide a tailor-made solution to handle all aspects of your real estate transaction including pre-listing preparation to best showcase your home. We also work with an extended list of service providers who can help meet all your needs related to the sale of your Margarita Place home. Find out what your historic Margarita Place home is worth TODAY. For most people, purchasing a home is the single largest and most exciting financial decision they can make. That is why we take finding a home for our clients very seriously. We're not only committed to finding you a home, but to finding you the absolute best home on the market at the best possible price, and if one does not exist on the market, we'll search off-market properties and do our very best to find you the right Margarita Place historic home. This website also serves as a tool for clients to search properties currently on the market, receive up to the minute market updates through email, and even request showings. Start searching now OR let us do it for you!